It is not only revenue streams that tend to be seasonal for farmers in developing countries. The demand and use of knowledge also follow seasonal patterns. 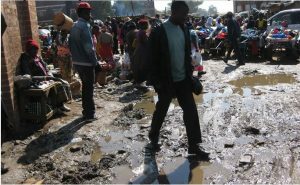 From leaking market sheds in Mbare market of Harare and makeshift stalls in Mitundu market of Lilongwe to landslides in the land of a thousand hills (Rwanda), Africa is an entirely different continent in the rainy season compared to winter. Just-in-time knowledge is critical in dealing with these situations as opposed to just-in-case knowledge. During the rainy season, most African rural areas are completely inaccessible due to poor road networks and broken bridges. Some roads are turned into rivers as terrains fail to deal with sudden downpours. All these issues negatively affect the demand and supply of food. When farmers and traders are not able to bring food to the market on time, nutrition and incomes among poor consumers are compromised. While some of the common expressions in development include one medical doctor per 1000 patients and one extension officer per 2000 farmers, engineering is one important profession that is not talked about in the same way. This is in spite of the fact that natural resources management at local level is definitely a mix of art and engineering. There have not been noticeable efforts to domesticate engineering into home-grown solutions. Rather than waiting for engineers to come and build bridges, roads and water sources, engineering knowledge should be distilled in such a way that local people can do some of the basic tasks like diverting water for later use and averting soil degradation. Water harvesting is not enough without the associated engineering knowledge. How do communities know what they know? People can see the value of engineering and other forms of knowledge if they see it having tangible value in local settings and situations like muddy roads and water-logged fields. This is often when people call up knowledge they could have been filing away during winter. They do not know what they know until desperate situations like flooding in markets and fields demands deep and probing answers. Rainy seasons in much of Africa demand different types of knowledge and other resources. Vehicle break downs are common and some rivers are full for days, cutting entire villages from other parts of the country. Desperate situations induced by the rainy season compel communities not to wait for knowledge or lessons to be volunteered by engineers local people have to go out and seek knowledge. Ideas and lessons compiled into manuals during winter may be found wanting during the rainy seasons, forcing communities to improvise and depend on their previous experiences. Food losses tend to be high in summer compared to winter in many African countries due to challenges related to dealing with excessive rainfall. Instead of waiting until the rainfall season presents enormous problems, governments and development agencies should consider empowering communities to proactively seek and identify relevant knowledge on a continuous basis. When knowledge identification and sharing is scheduled, success and failure become components of every activity in ways that avoid big mistakes. Knowledge generation and sharing becomes a clear expectation for the entire community, forcing the community to monitor if the collective expectation is being met. This process also uncovers the knowledge that nobody knows they know, until they start discussing and solving real problems like poor water drainage and land degradation. What are our major local challenges during the rainy season? What are our local “hot issues” in summer compared to winter? What knowledge would help us respond to conditions during different seasons? This entry was posted in Agricultural Intelligence, Agricultural Markets, eMKambo, ICTs and agriculture, Knowledge Transfer Africa, zimbabwe agriculture. Bookmark the permalink.